Do you need to model the electrical raceways? 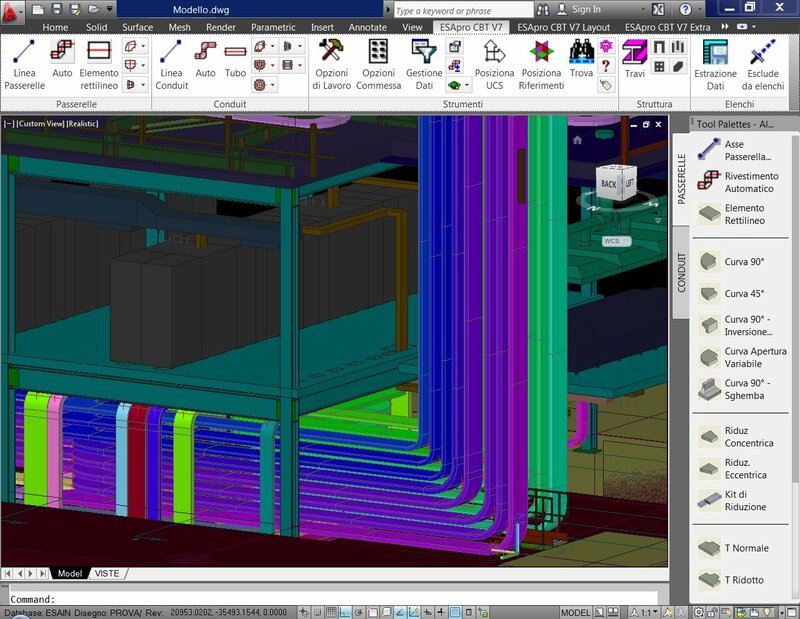 ESApro Cable Trays performs 3D modeling of electrical cable trays and conduits and provide the related material lists. The program is based on parametrical graphic functions generating the 3D model of the cable trays and conduit components by picking up the dimensional data from the centralized database. Once the 3D model is completed, the program generates the material list. The optional ESApro Cable Routing module performs the automatic routing of the cables within the cable trays. With more than 1.000 cable raceway components, ESApro Cable Trays provides a wide catalog ready for use and customizable by the user if necessary. Each part is provided with descriptions in different languages and an additional field is provided for the part number. The ESApro Cable Trays package contains a module for the fast creation of structural steel. Thanks to quick and intuitive interfaces it is possible to create beams (IPN, UPN, IPE, HE, LEQ etc.) by taking them from a customizable database and by adapting them to your own needs through simple shaping and editing commands. The program provides the bill of material of the beams and the total steel structure weight. A subsequent verification command is also provided, able to scan the whole plant. Based on the standard Microsoft SQL Server, the project database is shared by all the P&ID diagrams, the 3D Piping models, the isometric drawings and the electrical design environment. The “Publish” command tranfer all the data present in the drawing into the database, making this data available to the project team. The program can directly display a shaded viewof the plant, very useful when analyzing very complex areas. Moreover, when presenting a preview, it is possible to render the model in a very sophisticated way so to enrich it with realistic and impressive visual effects. The software can also make movies and produce animations. All the ESApro files are simple dwg file with standard AutoCAD entities only (lines, circles, blocks, etc.) included: no additional object enablers or conversion tools are therefore required to open or view such files. The interchange of files with other software is then very straightforward as all types of software capable of reading the DWG/DXF format or any other format exportable from AutoCAD (DGN, DWF, PDF), are all compatible with ESApro.